Tonight Jackson introduced me to the game of Farkel. He beat me by thousands of points, including rolling a straight good for 1,500 points. While a game of luck, Farkel also includes strategy, at which Jackson is pretty sharp. 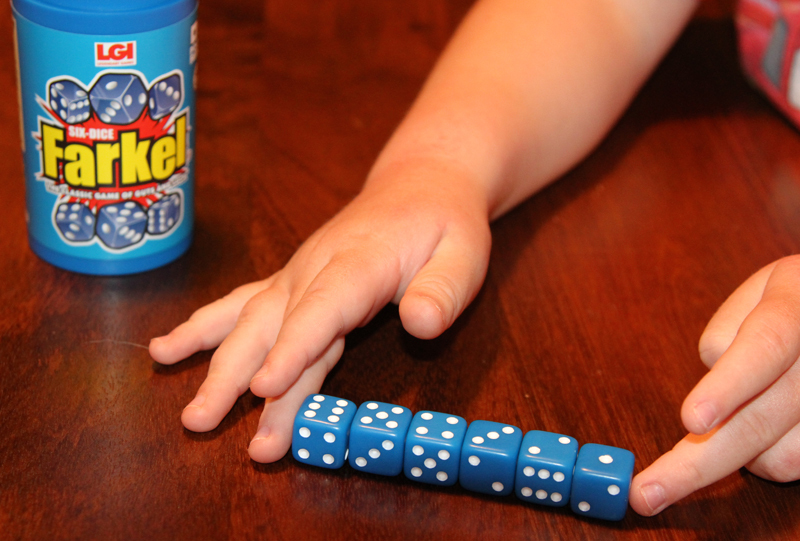 Tonight five-year-old grandson Jackson introduced me to the game of Six-Dice Farkel: The Classic Game of Guts and Luck. Where have I been that I didn’t know about this game?! We had a ball. Jackson practiced strategizing and his math skills while he beat me 10,750 to 6,700. (“Nanna, that means I won by 4,000 points. No, I mean more than 4,000 points.”) I strategized, too, but apparently not as well as Jackson did! Before starting to play, Jackson and I watched parts of four or five YouTube videos, each explaining the rules of the game. As silly as this YouTube video (below) is, it is the one that best illustrated the rules for us, including in a dialect/accent we understood. This entry was posted on March 23, 2012 at 10:06 pm and is filed under Uncategorized. You can follow any responses to this entry through the RSS 2.0 feed. You can skip to the end and leave a response. Pinging is currently not allowed. I’ve never heard of Farkel either – what a cool game. Cute video – good explanation of how to play. Not too many game pieces, not too complicated, good for practicing matt. Too funny that Jackson beat you, Louise. We’ve enjoyed this game now for a couple of years. Great to take on travels. Louise, what ever happened to just plain “reading” instructions that come with the game — :-)! Marti, Peg and Marsha: Your Farkel comments are fun! Marsha: I know what you mean about the instruction sheet. We did try to digest it but with how this one was written, the visual worked better for Jackson and me. I think it would be great for travels, too…small to pack and for such a diverse age range. You are the second person to write saying you’ve been having fun with it for years. Farkel is fun. I like to play with Nanna. I have a blog.